LexisNexis® will be retiring LexisNexis® Analyzer -- we hope you'll continue to conduct your expert witness, judge and attorney research with us using LexisNexis® Litigation Profile Suite. 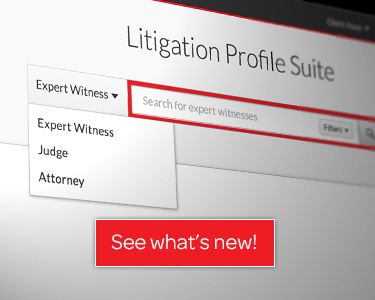 With LexisNexis Litigation Profile Suite you can take advantage of faster access to key content, greater search flexibility and time-saving features. Check out Lexis Advance® for any other legal research you were conducting with Analyzer and enjoy exceptional content, integrated tools and the new, intuitive design. Simply sign in to the Lexis Advance service with your current Lexis Advance ID and password. All your history and other preferences will be there waiting for you. If you don’t have a Lexis Advance ID, contact your account representative to request your new ID and password. If you don’t know your account representative, contact LexisNexis Customer Support for assistance at 800-543-6862.